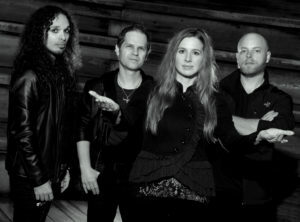 We are a symphonic rock band originally from San Francisco (CA), USA. The name Shaylon comes from ancient Gaelic and means “admirable”. We formed in July 2014 with the initial intent to blend the power of rock with the symphonic spirit of classical music, opera and the great melodies of pop. Nothing is more thrilling for Susie Uher Jiménez than performing, whether it be with professional opera companies, touring nationally with her pop/opera ensemble Bella Sorella, or this new path of singing with Shaylon. Susie joined Shaylon in fall of 2017, and is looking forward to the opportunity to create original music with the band, and to utilize all of her vocal range & vocal abilities for this exciting genre of Symphonic Metal. Born and raised in Castro Valley, California, Susie has a Bachelor of Music in Vocal Performance from University of the Pacific Conservatory, and Master of Music in Vocal Performance from New England Conservatory. She is a music educator, director, and voice teacher with over 20 years of teaching and performing experience in the San Francisco Bay Area. Composer, Author, Singer, Guitarist and Keyboardist, Charly started playing guitar at the age of 12 inspired by Brian May, Richie Sambora and Kai Hansen. Born in Milan (Italy) he grew up listening with accurate interest any kind of music since an early age. Even though the melodies of Greek composer Vangelis had a huge influence on his musical background, it is with the discovery of Rock and Heavy Metal that the flame within became a burning passion. After winning a scholarship, he graduated in Composition of Modern Music at CET (Centro Europeo di Toscolano) a very unique specializing Italian school for Composers, Authors, Arrangers and Interpreters, directed by legendary author, Mogol. After more than 20 years of experience and collaborations with several artists, in 2014 he formed Shaylon, a Symphonic Rock project inspired by bands like Queen, Nightwish, Muse and classical masters like Mozart, Bach, Vivaldi & Rossini. Surrounded by classical and rock music since childhood, he connected with the magic of sounds at an early age. At 5, he recalls drawing pictures of amps and electric guitars and by the age of 10, determined to play the instrument, he built his first guitar in his small hometown Satoraljaujhely, in Hungary. His first show with his home made electric guitar took place at his elementary school’s cafeteria. His inspirations and favorite bands are: The Beatles, U2, Deep Purple, Accept, Helloween, Queensryche, Bon Jovi & Dream Theater. When in 1992 his original band lost the original bassplayer he switched to bass and immediately fell in love with it. He is one of the founding members of the very successful Hungarian rock band Essex. After moving in the UK he joined the Chuck Brown Band from 2002 to 2005. In 2006 Sandor relocated to California and continued playing countless gigs and festival shows with different bands. In 2014 Sandor joined Shaylon and a new story begun.